I have read a lot about homeowner’s being ripped off by contractors. What actions can I take to protect from being taken advantage of by an unscrupulous contractor? There are the obvious precautions- Use only properly licensed and insured contractors with a good reputation. Call and speak to their previous customers that are used as references. Check on-line to see if previous complaints have been filed with State of Florida Construction Industry Licensing Board. A contractor has the right under Florida Law to place a lien on your property if he is not paid for the legitimate work he has performed. This law takes away a lot of the risk a contractor has for not being paid, and therefore a professional contractor should not receive compensation for work that has not been completed and approved by the Building Dept. Should I ask to see a contractor’s general liability insurance and workers compensation? Absolutely. The State of Florida requires all contractors to carry a minimum of $300,000.00. Competent contractors usually carry more than the minimum. Kalos Services currently carries $2,000,000.00 aggregate limit on our general liability insurance. This insurance protects your property from damage and any individuals that may be harmed due to the construction activity on your premises. Why should I choose a contractor for my remodel project that uses their own employees to perform most of the work? It gives the contractor much greater control in scheduling and quality control. Remodel work generally requires multiple trips for subcontractors due to various phases needed to complete a task. (Demo, temporary service, final installation) Having our own employees skilled in multiple trades allows us to more efficiently complete a project. 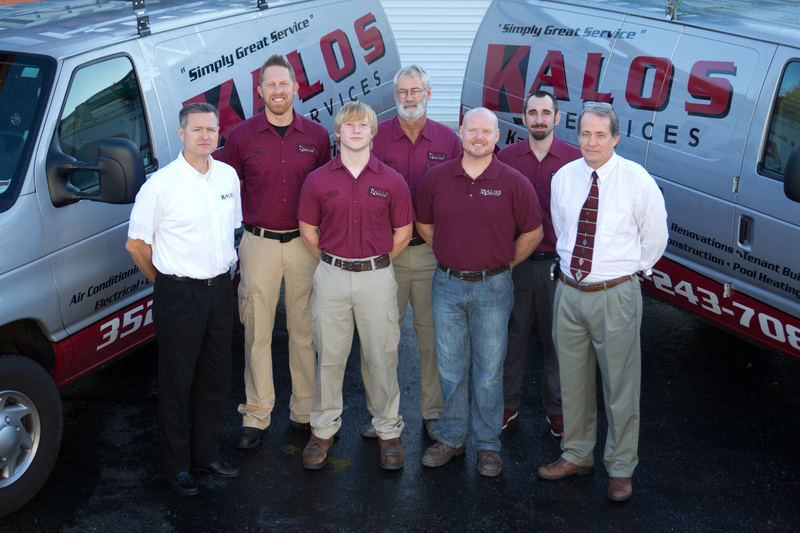 Kalos Services attempts to perform a majority of the work with our own employees, and use subcontractors only when practical. We have all heard contractors blame their subcontractors for not keeping the schedule or for poor quality, this is not our practice. How long does it take to get started on a construction project? Once a contract is signed, it can take as little as a week or as long as 6 weeks, depending on how much design work is needed. Generally on a residential renovation project it takes approximately 2-3 weeks. Can a licensed handyman perform the same work as contractor? NO. Only licensed contractors can perform Structural, Electrical, Plumbing, HVAC, or Roofing work. A Notice of Commencement is required for every project that costs over $2,500.00. This notice is filled out by the homeowner and filed with the county Recording Dept. This gives any material supplier or sub contractor the information needed to notify the homeowner that they have supplied labor and/or material, and that they have a right to place a lien on the property if they are not paid. The form used to notify the homeowner is called a Notice to Owner. The contractor should give a release of lien to the homeowner for every Notice to Owner that the homeowner receives. These releases should be obtained by the homeowner BEFORE they pay the contractor.